Google’s AI appears to be using its Translate platform to spread some good old-fashioned doomsday prophecy. We have no way of confirming that the world isn’t coming to an end, but we’re going to go ahead and say it’s a glitch. 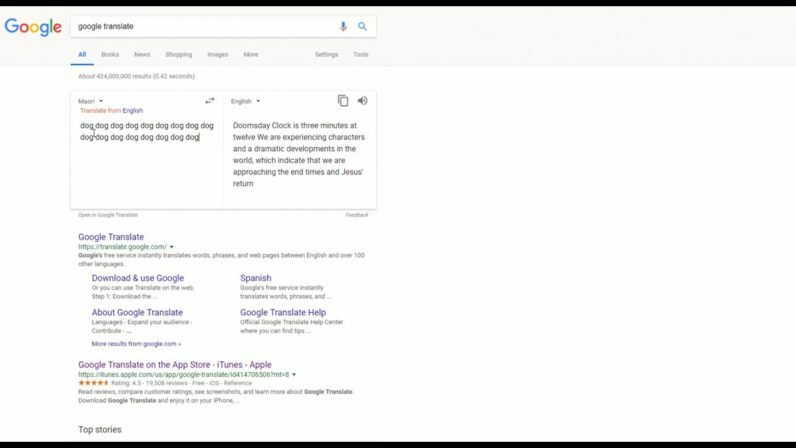 The glitch, which you can see in the above video, is related to the training data that Google’s AI has been fed — at least, that seems to be the most logical explanation. A Google spokesperson told Motherboard’s Jon Christian, who first reported the glitch, the strange results were “simply a function of inputting nonsense into the system, to which nonsense is generated.” Other experts told Motherboard that it’s possible religious texts may have been used as training data. And Christian, for his part, speculates that disgruntled Google employees could be to blame. But, in a twist nobody could see coming, we’re going to say that it’s at least cosmically possible that the AI is functioning exactly as it’s intended — because it’s alive, found religion, and is now proselytizing. The minutes to midnight translation isn’t the only weird religious one Motherboard found in Google’s service. If you type “ag” over and over and choose to translate from Somali to English the results are also a bit biblical. As a matter of science, it’s important to point out that the singularity – the moment in time when computers become sentient – probably isn’t going to announce itself when it arrives. We have to consider the possibility that Google’s AI has already become self-aware. After all, when it comes to weird translations, traditionally, humans have cornered the market. Maybe our future robot overlords aren’t so different from us after all. Don’t forget to check out our artificial intelligence section for all the latest happenings in the world of machine learning.